Chicago is a real contrast to New York, the weather is less humid and the city feels more modern and clean. Apparently it’s called the windy city because when they first built the skyscrapers the wind blew so hard between buildings or alternatively as a result of the political hot air generated when the city was trying to secure the World’s Fair after Paris at the start of the 20th century; take your pick! Taking advantage of our Hop-on-Hop-off bus ticket we took the chance to tour the city on an open top bus (no rain this time but it was touch and go for a little while). The tour was a revelation, this is a lovely city with great architecture spanning over one hundred years; beautiful parks; fantastic museums (more than we can see in our time here) and a breath taking lakeside location complimented by parks. Lake Michigan is 116 miles wide and 300 miles long, standing by the marina looking out across the lake it is almost impossible to grasp that it is freshwater. Out bus guide explained that in the winter the water near the shore can freeze up to 8ft thick, it is illegal to leave boats in the water in the winter because the ice will crush them. Having found our bearings on the bus we decided to do some exploring on foot. 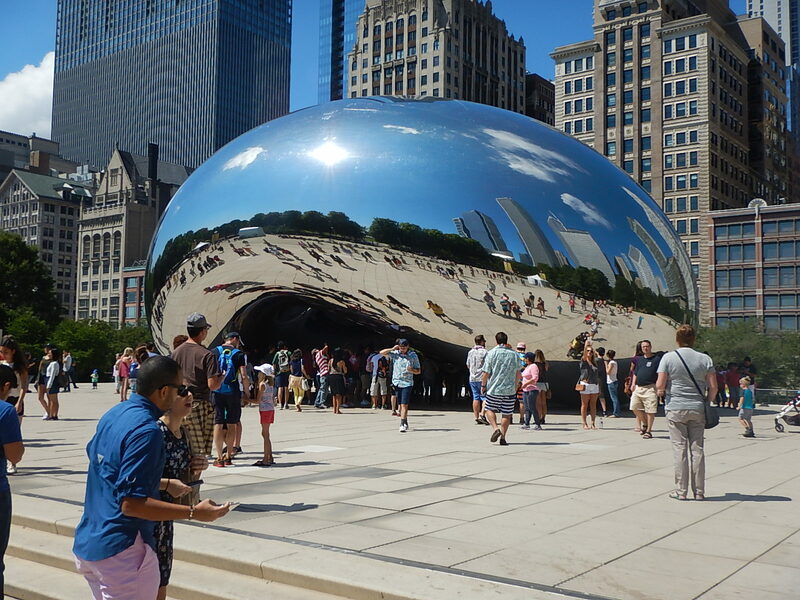 We visited Millennium Park and saw Anish Kapoor’s sculpture Cloud Gate which is known locally as The Bean because it looks exactly like a giant steel bean. We walked along the Lakeshore Trail until it joined the Riverside Walk leading back into the city centre. The walk runs underneath a whole series of bridges which carry all the main streets across the river, apparently they are raised on Saturdays and Wednesdays to let boats through, sadly we won’t be here to see that. We also walked the ‘Magnificent Mile’ a very upmarket shopping street with branches of Tiffany’s, Burberry and, bizarrely, Top Shop!! In the course of our wandering we came across a mosaic mural by Mark Chagall and a huge sculpture of a dog by Picasso (local children use it as a slide!! ), this is a city that enjoys its public artwork. There is lots more to see, I guess we will have to come back another day. I have read lots of books set in Chicago so I was interested to hear your description. Sounds as I imagined. All here well and Beth is enjoying the rest. She even made it into the surf with her dad yesterday. Great to hear about Beth’s progress. Chicago was really a great surprise, well worth a visit!